It’s no secret that I’m not that gifted in the kitchen. Rarely do I have anything in my fridge beyond the bare necessities: wine and water. On a good day, I have bananas and almond milk for my morning protein smoothies. I dine out, and I do so with frightening regularity—i.e. daily. It’s hard to stay healthy—so I often opt for Sweetgreen or Glen’s Garden Market for lunch. That said, I love to entertain—just without the cooking. I’ve been relying on some of my go-to catering options, Heirloom Catering & Glen’s, to help me with the food component. 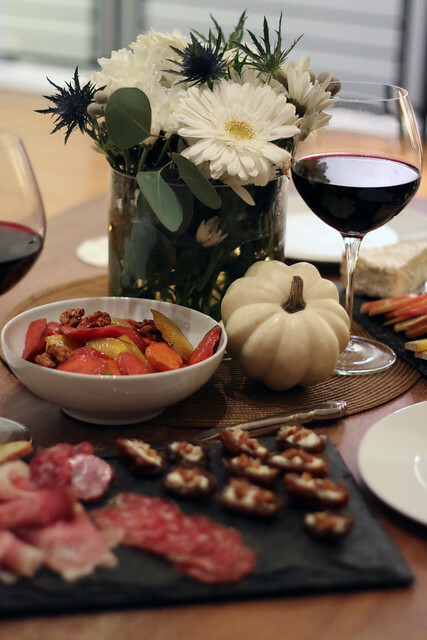 Recently, I hosted a winter wine Wednesday, as the cold weather just makes you want to stay in. 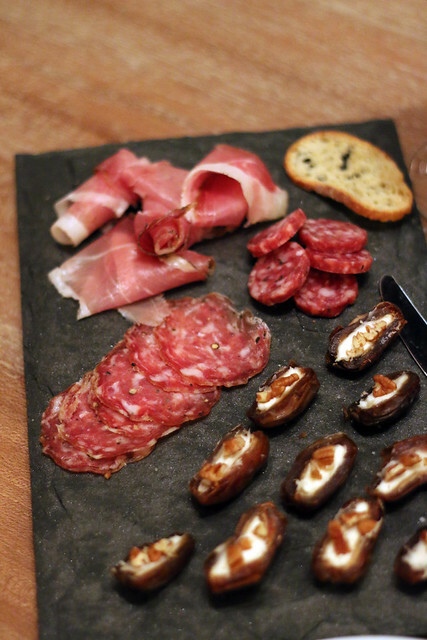 So, we’re sharing some easy hostessing recipes for the impending snowpocalypse. The color scheme (because there should always be a color scheme) on this particular non-occassion was burgundy, white, and gold. In preparation, I ordered some fresh votives from Amazon and had a bouquet of blooms delivered from UrbanStems, who did a stunning job with their seasonal bouquets this year. I adore my new dishes from Snowe, as they are spectacularly functional, simple, and beautiful all at the same time. Snowe is a new direct-to-consumer line of housewares that only makes all white everything: white bed linens, white towels, white dishes. European made, the dishes are simple and sleek—perfect for people who may be changing décor, moving in with boyfriends, or wanting uncomplicated place settings. Rather than set the dining table, we set the coffee table, allowing us to all cozy up around the couch in a comfortable, relaxed setting. We set the table, added some Burgundy napkins, threw the flowers in a vase, and lit some candles. My co-hostess was Lauren, who makes an easy, crowd-pleasing appetizer of stuffed dates each time she has guests. She’s sure to always have the necessities for this app and lots of wine on hand—in case she has guests over unexpectedly. Strapped for time, we relied on Glen’s catering for the bulk of our dinner, picking up beef prime rib, potatoes for mashed potatoes, and an order of the carrots and walnuts. 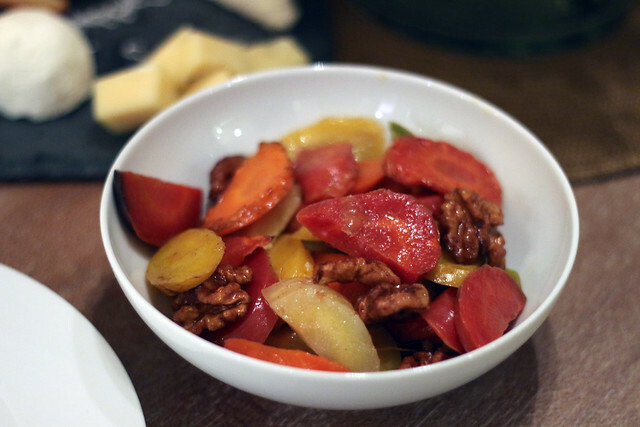 These are not normal carrots and walnuts, but Maple-roasted carrots served with roasted walnuts. The dish is sweet and satisfying—both hearty and healthy at the same time. As no girls night is complete without wine and cheese, we picked up a farmstead cheese platter from Glen’s. 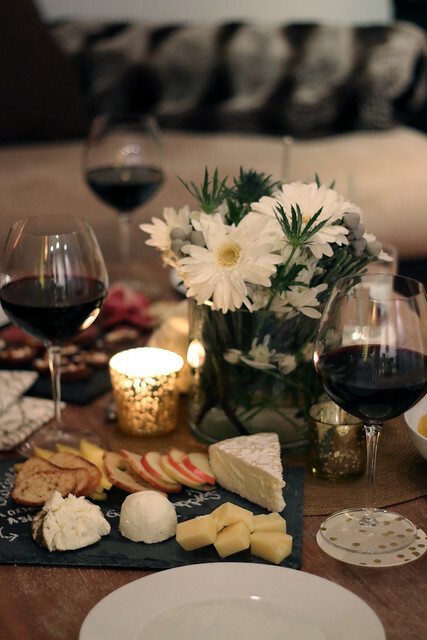 You can order the cheese in varying sizes, depending upon the size of your dinner party. 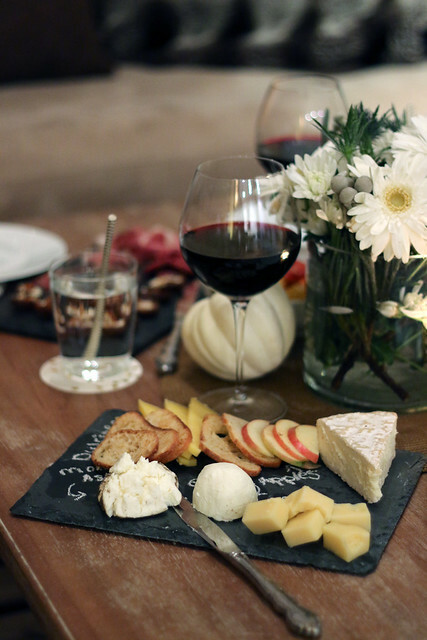 The cheese is gourmet, local, and served with all the accoutrements—local jams and fruits. 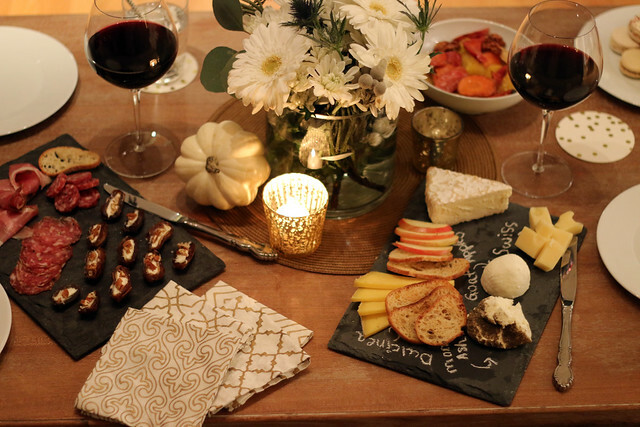 We placed our cheese on a slate board and labeled it with chalk for a Pinterest-approved spread. Just order one from World Market or Williams Sonoma, pick up your favorite cheeses, jams, and a baguette at your local bodega (Glens!) and tap your friend with the nicest handwriting to do the heavy lifting. You can check out Glen’s catering menu here and read about the monthly cheese club here. Meanwhile, as girls’ night requires dessert, I had tried my hand at Paleo Pecan Pie Bars, which came out perfectly. Gluten-free baking can be a challenge, but I was pleased with these simple and satisfying dessert bars. Because one dessert is never enough, we picked up a second gluten-free (and kosher!) 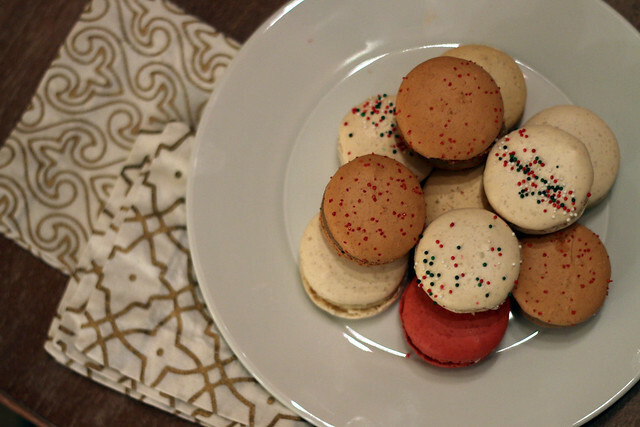 dessert—Olivia Macaron. These decadent little French pastries are my absolute favorite treat. I’d recommend the salted caramel and vanilla flavors, as those are my personal favorite. 1. With butcher knife, cut dates in half length-wise and remove pits. 2. Take spoon and fill with marscapone. 4. Top with sea salt. 2. Put 4 cups cashews in food processor, blending until it’s a crumbly flour like blend. 3. Add other ingredients into food processor, blending and pulsing as necessary, until the ingredients are evenly mixed. The texture of the crust should be moist and crumbly but sticking together well. A ball will begin to form. 4. Dump out the contents of the blender into an 8×8 or 10×10 inch casserole dish and press the dough evenly over the surface and up the sides. 5. For the filling: place maple syrup, eggs, coconut oil and vanilla into a blender and puree until smooth, 20 to 30 seconds. 6. Stir in pecans and nuts by hand. 7. Pour filling on top of the crust. It will be very runny. 8. Bake for 25 minutes on 325 degrees. 9. Allow bars to cool before cutting into squares and serving.